No. 22 & 22A, Jalan TP 7/5, SIME UEP Industrial Park, Section 26, 40400 Shah Alam, Selangor, Malaysia. AED Kompresorren (M) Sdn Bhd has more than 10 year experience in dealing with wide range of air compressors especially from ELGI. The team consist more than 15 engineer & maintenance technician that had experience around 8-10 years averagely. With such capacity of experience, we ensure customer will be able to get top notch skills in handling the ELGI Air Compressor that we carried. With annual training provided to refresh and upgrade the skills of engineer and technician with the latest technology that available in the market. 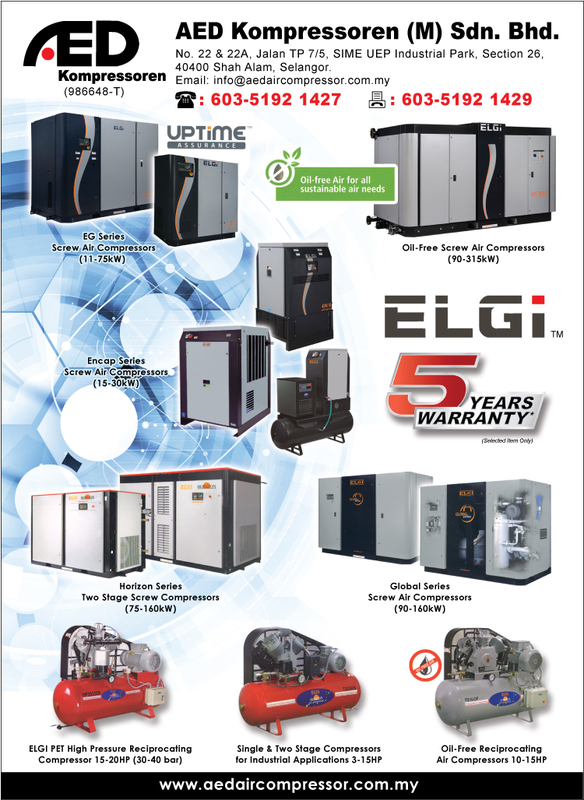 Our Commitment to our customer that if your ELGI air compressor is down and the situation warrants, we will send our technician and parts needed to jobsites ensuring the it will be back on-line. Where we put ourselves in customer position and understand the criticalness that damages may cause due to downtime. · We provide contractual service to ensure compressor are well taken care in a regular basis. · Consultation of compressor design, piping and installation. We ensure we have all critical part stores in our service center and representative office to minimize downtime.